Mother's Day is only a couple weeks away (Sunday, May 9th). Do you know what you're going to give your mom? Gifts of time, and homemade gifts are probably some of the best gifts you can give your mom, but sometimes you live too far away to get together, or don't have time to make something special. I've posted some do good Mother's Day gift and donation ideas below, as a continuation of last year's Mother's Day Donation Ideas post. Five percent of your purchase from Organic Bouquet's Flowers for Good program will go to your choice of a variety of nonprofit partners. The Global Fund for Women's online store features companies who donate a portion of their sales to the Global Fund for Women like Alima Pure Mineral Makeup and Putumayo's Women of the World: Acoustic CD. World of Good by eBay has all kinds of, "organic, sustainable, natural, environmentally responsible, fair trade, socially conscious and sweatshop free gifts for Mom." Women for Women International's online store offers products made by women in their programs, or from their sponsoring partners. MADRE also has an online store where you can buy a gift that was hand-crafted by women from their sister organizations. My Ten Places to Buy Gifts That Support Women Artisans post on the Global Center for Cultural Entrepreneurship blog has links to ten more places to buy do-good gifts. If you make a donation to Women for Women International in honor of your mom, they will send her a Mother's Day card, or e-card. You can give, "one for mom, one for the earth," when you give a sponsorship gift through the Sierra Club. You can sponsor things like Yosemite National Park and the Arctic National Refuge. When you give a refugee a "lifesaving gift" like prenatal care, school supplies, or blankets through a donation to the International Rescue Committee, they will send your mom a card, or e-card. Plus, your gift will be matched to support their maternal health programs in Sierra Leone. The Ploughshares Fund will send your mom a card, a necklace, or flowers, depending upon the amount you donate. Your gift will be matched, "by a group of generous philanthropists, all mothers themselves." MADRE will also send a card to your mom if you make a donation in her honor. Sending a Care2 Mother's Day e-Card will help you earn "butterfly credits" that you can redeem on Care2 as a donation to a variety of causes. What are your do-good gift ideas for Mother's Day? Image credit: Photo by me of two Palomas Aprons, a project of Border Partners. 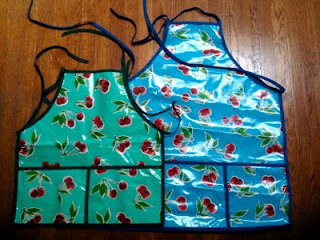 The aprons are designed and made in Mexico by women who sew to support themselves and their families. Full disclosure: I have supported, or worked for some of the organizations mentioned. Happy Monday, Have Fun Do Gooders! I don't like to recommend social media tools to my clients unless I've used them myself, so I'm trying Formspring, a tool I read about in Blogging for Bliss. Formspring allows your readers to ask questions, and for you to post answers on your blog, Facebook, Twitter, or Tumblr. I think it might be a helpful tool for some of the folks I work with. Will you ask me a few questions so I can test it out? Those of you who are regular readers know that I've been experimenting with supporting two of my pals' work by being a part of their affiliate programs: Jenn's Right Brain Business Plan, and Kimberly's eco-fashion line, TranquiliT. They've both got cool stuff coming up that I wanted to tell you about. 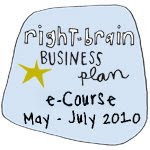 Jenn is teaching her Right Brain Business Plan e-course May 17-July 9th. I did the course this winter and really enjoyed it. Who knew business planning could be so fun? If you're not sure whether the e-course is right for you, you could try out her Right Brain Business Plan e-book and Guided Visualization first. TranquiliT was recently nominated for an Eco-Chic Rising Star award. Yay! On Earth Day, April 22nd, they're having a sale. Wahoo! You can save 20% by using the code EARTH, and you'll receive your order in a complimentary 100% recycled tote. That's a photo (left) of their all-in-one wrap dress. One of these days I'll post a photo of me in my hoodie, which I wear almost every week to ShimmyPop! class. You can watch a little video of the TranquiliT photo shoot for their Spring line below. Sometimes it's easier to tell what clothes look like when you see them in motion. Enjoy! "The New Moon and first quarter, or waxing phases, are considered fertile and wet. The new and first-quarter phases, known as the light of the Moon, are considered good for planting above-ground crops, putting down sod, grafting trees, and transplanting." It's a good day for not only planting real seeds, but also for planting the "seeds" of your dreams, goals, wishes, and intentions for the next month. 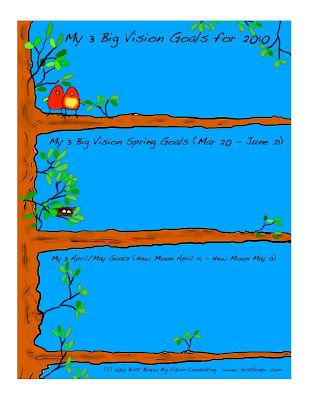 My hubs illustrated a spring-themed Big Vision worksheet (see the cute eggs in the nest?) for you to download and fill out. Here is the dropbox link to download the PDF. Let me know if you have any trouble with it. Those of you who downloaded the Feb/March and March/April worksheets know the drill. Remember, it is OK if your goals grow and change. 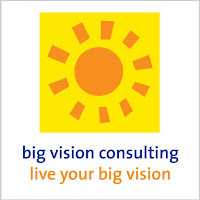 Don't be afraid to revise your 2010 and seasonal goals each month. For newbies, start by writing down your three big goals for 2010. Take one of those 2010 goals, and write down what you would like to achieve, related to that goal, during the spring (March 20-June 21). 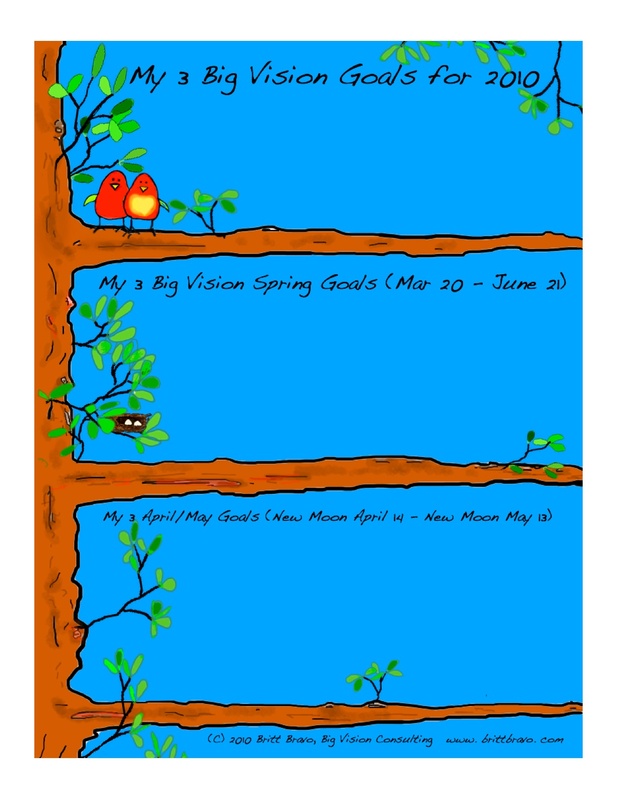 Then, write down one thing you would like to achieve related to your spring goal during the next lunar month (April 14-May 13). Repeat the process for your other two 2010 goals. If you feel yourself tightening up around making goals, put your feet on the floor, take a deep breath, look around, and relax! Think of your goals as little wishes you're making. Know that writing them down, looking at them throughout the month, and taking small steps towards achieving them will make them a little more likely to come true, and if they don't, no biggie! You have next month to review them, decide if you need to take different actions, and make new ones. My favorite TV show right now is Jamie Oliver's Food Revolution. Yes, it has reality show moments (really, did the high school students have to cook a meal for 80 people after a week of training? ), but its message is clear: we need to return to eating real (unprocessed) food, and to cooking from scratch. The show takes place in Huntington, West Virginia, one of the country's "fattest" and "unhealthiest" cities. During the episodes I've watched so far, Oliver worked with one elementary school, one high school, and one family to replace the tremendous amounts of processed food they eat with fresh, home-cooked food. Seeing so many unhealthily overweight people (one adolescent is already showing the early signs of diabetes, another has spots on her liver) is disturbing, but knowing that a solution is within reach--eating real food--makes it an exciting program to watch. I also love cooking, so watching other people, especially young people, get jazzed about cooking, is fun to see. I'd really like the show to stay on the air, and for the project to grow to other cities, so I'm encouraging you to watch it, and if you like it, to tell others about it. You can view the three previously aired episodes of Jamie Oliver's Food Revolution online (for free) on ABC, and catch the remaining three on Fridays 9/8c. If you've already watching the show, what do you think of it? Below is a 2-minute video about, "5 Things You Need to Know - Jamie Oliver's Food Revolution"
Jamie Oliver Turns the Spotlight On Our Own Homegrown Heroes by Kerry Trueman on Civil Eats. Jamie Oliver: School Food Revolution or Reality TV Rubbish? from Lettuce and Kale.